trick or treat « Midlife Crisis Crossover! 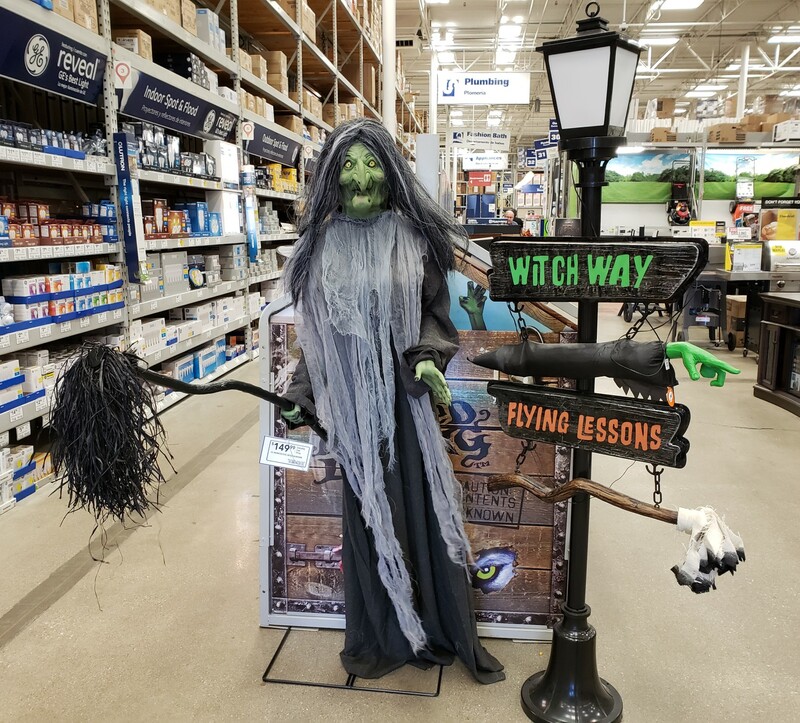 When the Halloween, Thanksgiving, and Christmas decorations all compete for shelf space at the same time, it gets hard to remember which holiday is WITCH. EEEEEEH-HEE-HEE-HEE-HEEEEEEEE! Previously on Midlife Crisis Crossover: each year since 2008 I’ve kept statistics on the number of trick-or-treaters brave enough to approach our doorstep during the Halloween celebration of neighborhood unity and beneficent snack donation. I began tracking our numbers partly for future candy inventory purposes and partly out of curiosity, so now it’s a tradition for me. Like many bloggers there’s a stats junkie in me that thrives on taking head counts, no matter how discouraging the results. 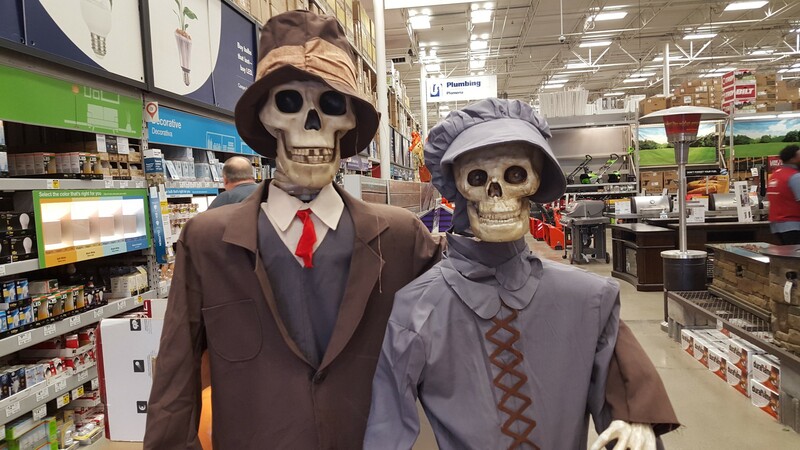 Happy couple enjoying their minutes in the Halloween spotlight at a local hardware store before Santa shoves them out of the way. 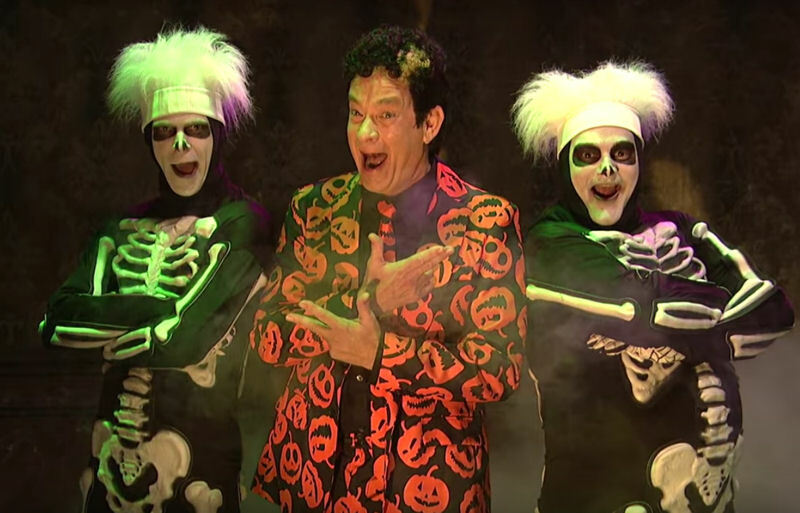 Oddly, I never took a single Halloween-related photo this year, so instead please enjoy this nearly irrelevant salute to David S. Pumpkins before he changes into his Thanksgiving gear. Previously on Midlife Crisis Crossover: each year since 2008 I’ve kept statistics on the number of trick-or-treaters brave enough to approach our doorstep during the Halloween celebration of neighborhood unity and beneficent snack donation. I began tracking our numbers partly for future candy inventory purposes and partly out of curiosity, so now it’s a tradition for me. Like many bloggers there’s a stats junkie in me that fiends for taking head counts, no matter how disheartening the results. Right this way for our annual holiday stats round-up! 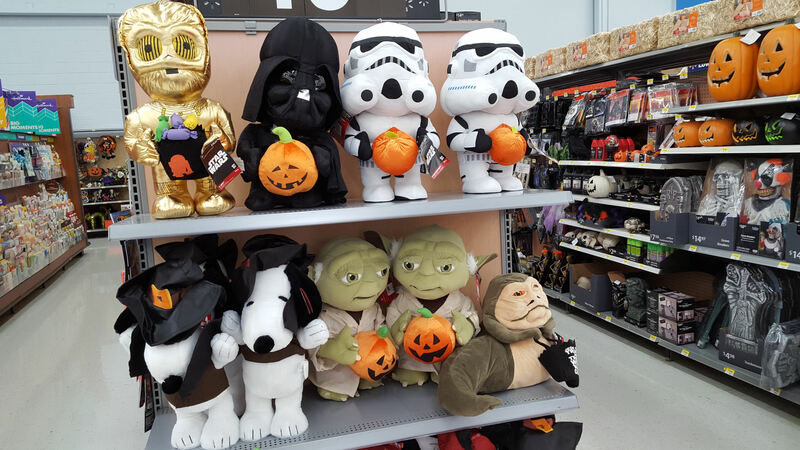 At Walmart, The Force infringes on the Great Pumpkin’s religious turf. Once again our annual Halloween traditions were besieged with lousy weather that interfered with the one day out of the entire year that my neighbors and I agree to look at each other. Fortunately, this year Mother Nature compromised: temperatures were in the rather hospitable low 50s, much preferable to last year’s anti-seasonal snowfall, and the rains didn’t arrive till around 7:30. In fact, the precipitation was so gentle that we no idea it was even raining till I went to shut off the lights at 8:30. That went a long way toward explaining why we’d gone a full 55 minutes with no further visitors. Duh. Right this way for three more photos, including my wife’s first costume in years! Maybe next year we can buy new Halloween decorations with voice chips that sing Christmas carols. The photo at left was taken earlier tonight, on Halloween night. No, those aren’t real birds. Yes, that is real snow. This kind of poorly timed, anti-holiday pandemonium is what happens when you live in a state that refuses to legislate holiday weather. THANKS, YOU PARTISAN HACKS. I’ll remember this next week on Election Day and all of you will pay somehow. We knew tonight would be rough. Everyone around us has been talking about the ominous weather forecast for days and preparing for either disappointment or pneumonia. Last year’s event wasn’t freezing or flurrying; worse, it brought a severe thunderstorm that forced Indianapolis to take unprecedented drastic measures and postpone Halloween till November 1st. I didn’t blame them, but the rescheduling killed our turnout. If there were a cartoon nemesis actively trying to end Halloween as part of his master plan to take over the world, he probably spent that night cackling and proposing toasts to himself. Tonight’s Halloween proceeded on schedule, despite some early light rain and sharp, gusty winds all throughout. I understand snowflakes showed up much earlier in other parts of Indiana, but ours came later. Regardless, the damage was done. We saw very few kids under age five, very few loners braving the harshness solo, and very few young Method actors opting out of winter gear in the name of costume integrity. Right this way for this year’s attendance figures! 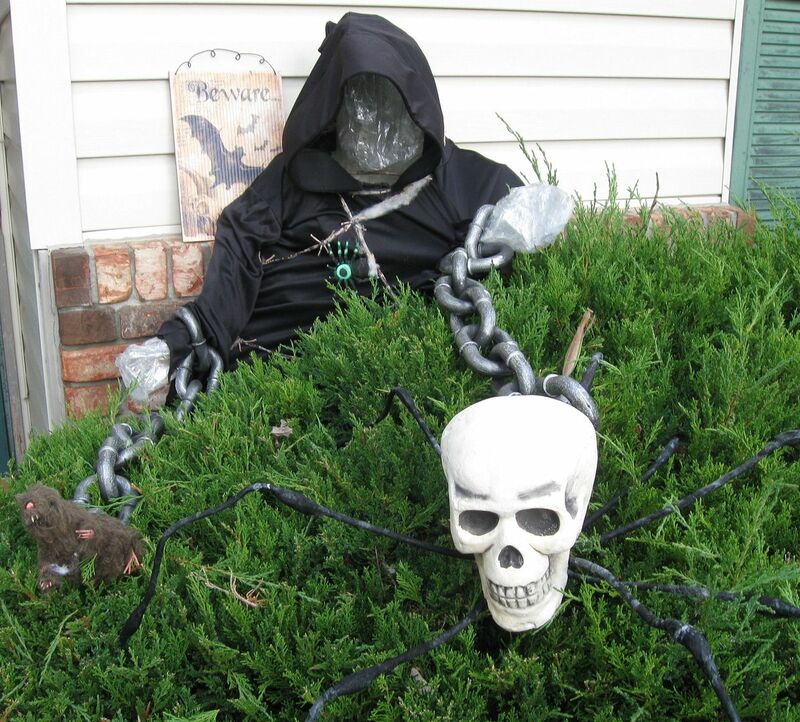 My two perennial centerpieces, the disturbing duo of Plastic Faceless Reaper and the Bewildering Spider-Skull . And MCC readers who look closely will recognize a character from a previous entry! First time in my life, as far as I can recall: this year the city of Indianapolis postponed trick-or-treating until November 1st due to a severe thunderstorm forecast for Halloween night. Considering how the eventual storm left thousands of residents without power for hours, I can’t dispute that it was the right call from a public safety standpoint. Our household was spared the worst of the ostensible onslaught. 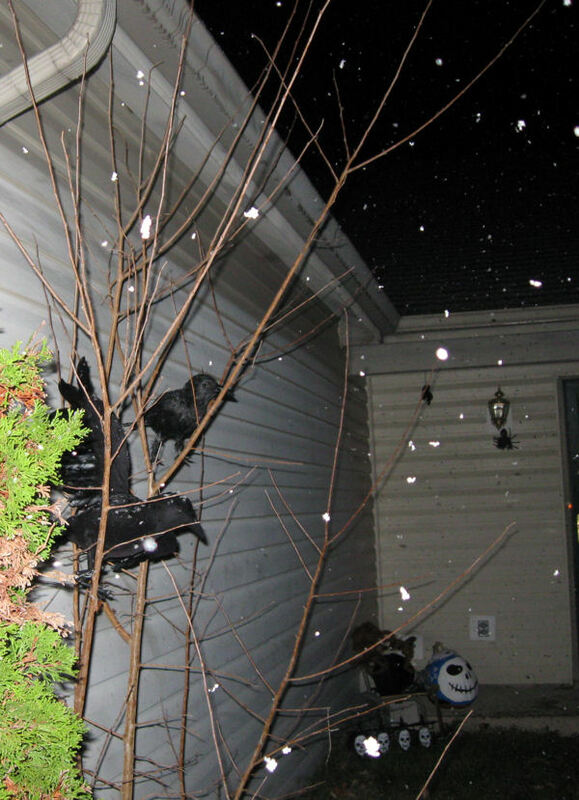 Our lights blinked once, and one of my Halloween crows fell on its side. If there’s a problem level more insignificant than “first-world problems”, that’s where our threat level fell. The unavoidable rain delay killed our neighborhood turnout, though.